“If I tried to tell you what her role is at the club I would be diminishing that role. Everywhere I go, everybody knows Candace. Everybody knows her because all their kids have been schooled by her." Candace Porter was on a first date with an avid sailor named Dave when she boarded a 20-foot C Scow and embarked on her first sailing voyage. Unfortunately, the high winds and choppy conditions on Lake Beulah caused the scow to collide with another one, creating a rather expensive hole in the boat. Porter admitted it wasn’t the best first date, but she stuck with sailing, married Dave, brought five more sailors into the world and became an instrumental figure at the Lake Beulah Yacht Club and the Midwest sailing scene. The 125-year-old Lake Beulah Yacht Club is home to 84 boats in four classes, including 32 C Scows that comprise the largest fleet of its class in the nation. From mid-May to early October – when Midwest lakes are sailable – the club races three days per week and relies on volunteers to staff events, govern itself and maintain its fleet. Porter, a 38-year member and volunteer, spends most of her waking hours doing something sailing related. Twenty nine-year-old Christine McNeil, Porter’s youngest child, said growing up in a house of seven sailors was wet, sandy and competitive. In the summer the kids were on the water at least five days a week at sailing school and walked the quarter mile to and from the club. McNeil said there constantly was – and still is – someone hosing down or putting a boat together in the front lawn of the Porter house. If I can build a website on SportsEngine, anyone can build a website on SportsEngine. For the most part, sailing with each other, competing against each other and sharing equipment benefited the Porter children. However, in at least one instance, having multiple children on the water backfired. In the sailing offseason, McNeil and her siblings ran cross country and track and watched as their mother devoted the same energy toward the program’s booster club that she did at the yacht club. Through nearly four decades of applying this attitude toward sailing, Porter has volunteered in nearly every capacity imaginable. 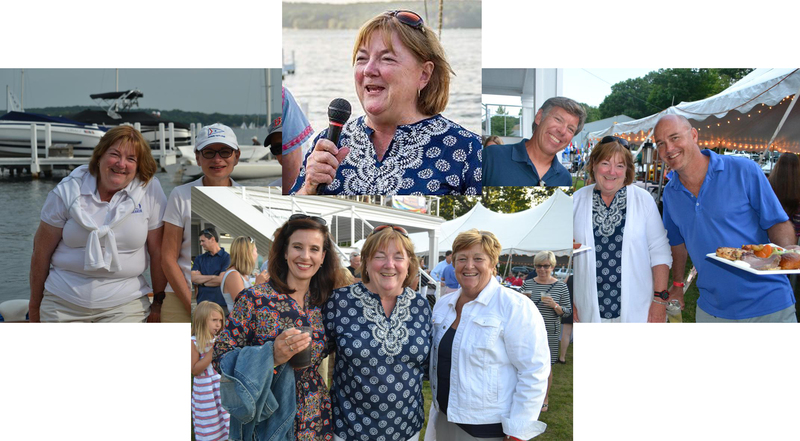 Her most notable roles include Commodore of the Inland Lake Yachting Association, editor of Scowlines, the association’s publication that reaches more than 2,600 people and the first chairperson of the Optimist (known as Optis) Regatta for sailors 16 and under. Lake Beulah Yacht Club Commodore Steve Barth said Porter is like the Mother Hen of Midwest sailing. 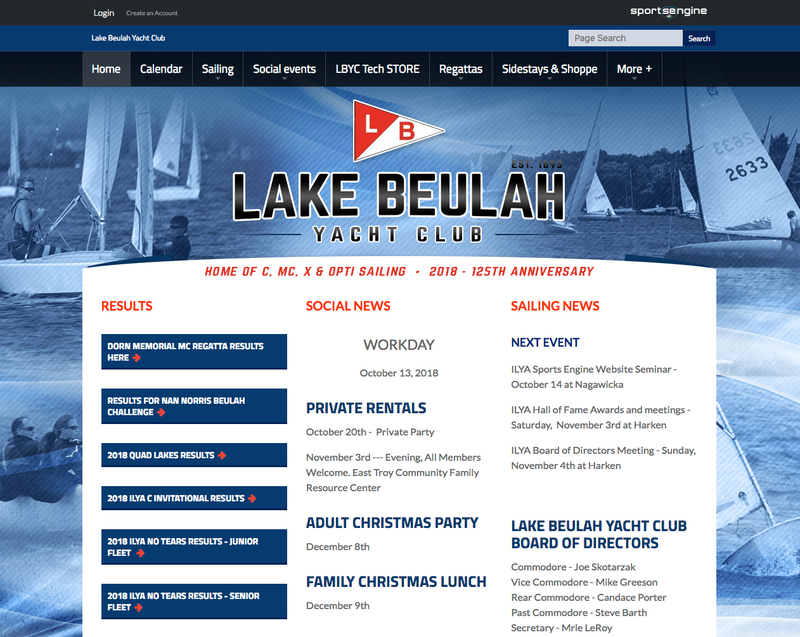 With Porter at the helm, the Lake Beulah Yacht Club site is an incredibly robust, organized and well-designed website. The club’s hectic summer calendar is meticulously maintained and accessible to its members. Porter also transferred a decade’s-worth of racing results, documentation and photos for members to reference at a moment’s notice. Perhaps the biggest impact the new platform provided was in registration. Before the switch, the club’s treasurer (a position Porter held for a period) collected, recorded and stored checks and registration documents by hand. McNeil recalls members dropping cash boxes off at the house for Porter to handle. Now operated through SportsEngine, the club’s annual registration is entirely online, which saves a tremendous amount of hassle for the club’s members and volunteers, aside from a few octogenarians that are still refining their computer skills. The time saved through online registration has allowed Porter to focus more on promoting sailing at the youth levels, watching her own children race and sneaking in a few extra hours of sleep. “I’m up to seven hours a night, which is about three hours more than I got before I retired,” Porter said with a laugh. Despite her best efforts to fly under the radar, Porter was recognized for her devotion to sailing in 2017 with the US Sailing’s C.R.E.W. Award. Her efforts at Lake Beulah have also produced two Rolex Yachtswomen of the Year in Stephanie Roble (2014) and Annie Haeger (2015). Haeger competed in the 2016 Summer Olympics Games in Rio de Janeiro, when more than 15 club members travel to watch her race. Roble is making a strong bid for the 2020 Olympics in Tokyo with the same support system. McNeil, who grew up sailing with Roble and Haeger, joked that there must be something in the water of Lake Beulah but knows that the club members’ success begins onshore. Barth said there is a strong sense of community on Lake Beulah – both within the yacht club and outside of it.